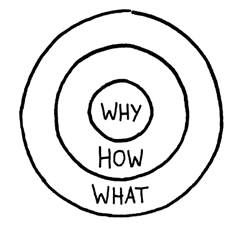 I just finished a book by Simon Sinek called “Start With Why”. The basic premise of the book is that in order to create a truly strong organization, you need to determine the “Why” (your reason for existing), from it derive your “how” (it will be achieved) and then your “what” (you will actually do). On first glance, the premise seems to be very similar in concept to the clichéd corporate “mission/vision” exercises that are performed on an offsite retreat with a facilitator called Moonbeam, but actually it’s much simpler than that, and that’s what I appreciated about it. His idea is based on a model he called The Golden Circle. “The Golden Circle is a model that codifies the three distinct and interdependent elements (Why, How, What) that makes any person or organization function at its highest ability. The bulk of the book is why you should start with why, giving examples from great organizations like Apple, onlinecasinokiwi.com Southwest etc. It’s a bit sparse on practical steps on how to go about determining your own why, but I guess that’s because he’s trying to sell an online course/membership site at www.startwithwhy.com (which is a nice site by the way). If you can define a powerful “Why” for your company, that your employees and your customers can understand on a fundamental, emotional (gut) level, you will not only have an advantage over your competitors who haven’t defined and communicated it, but a more significant & meaningful existence. I will be working on this for my companies over the coming months.